VIRGIL VAN DIJK celebrated his first Premier League win as the world’s most expensive defender on his return to Southampton as Roberto Firmino and Mohamed Salah ensured Liverpool ran out 2-0 winners at St Mary’s on Sunday. Van Dijk was jeered by the home support following his £75 million ($104 million) move to Anfield last month, but got his revenge by shutting out a toothless Saints side who drop into the relegation zone. VIRGIL VAN DIJK had been subjected to criticism following shock defeats by Swansea and West Brom and conceding a last-gasp penalty as Spurs snatched a draw at Anfield in his previous three outings. 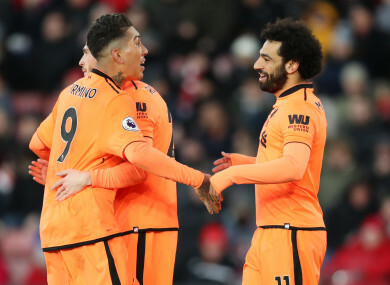 Email “Firmino and Salah on target as Liverpool heap more misery on Southampton”. Feedback on “Firmino and Salah on target as Liverpool heap more misery on Southampton”.